Circulation for the New York Times has dropped in the last year and, earlier this year, they reported a $74 million quarterly loss. Last year they reduced their newsroom staff by 100 jobs. Now, another 100 jobs are being cut. 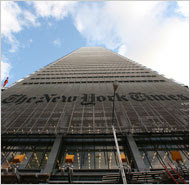 The New York Times plans to eliminate 100 newsroom jobs — about 8 percent of the total — by year’s end, offering buyouts to union and non-union employees, and resorting to layoffs if it cannot get enough people to leave voluntarily, the paper announced on Monday. Apparently all the media "gatekeepers" and fact checkers were laid off decades ago.